I needed a half rack for my home gym and this was easily the most affordable on the market. I've always felt this was a safe and sturdy half rack, great for all my exercises: Bench press, squats, deadlifts, and bicep curls, etc. etc. Great piece of equipment. Great service and advice. Very well built piece of equipment. Great service and advice. Very good quality piece. Fits on the work bench well and comfortable to use. Great service. What a great machine. Get a great total body workout fast. Love this piece of equipment. Assembles fast. Great service. Highly recommend this. 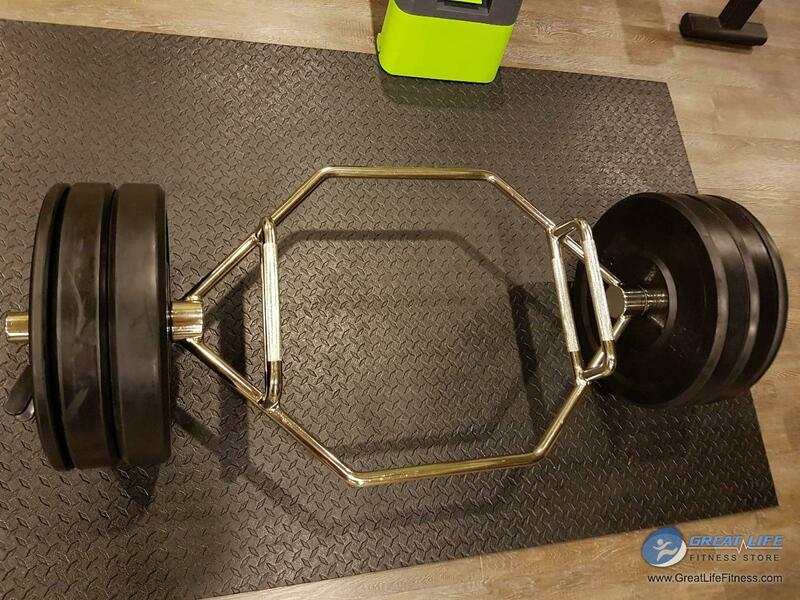 I had been doing deadlifts with regular iron plates for a while and it required extra effort as I had to be careful not to drop the bar and weight, otherwise it would damage my floor. It was especially problematic when I wanted to keep going to a point of failure. Because I am concerned about dropping it on the floor, I always had to stop my reps before I reach to my failure point, never knowing if I could have done one or more reps. So I've purchased a few pairs of these plates and they provide amazing peace of mind. I keep going until I fail and at that point I just drop the bar and these rubber plates hit the floor quietly with slight bounce back. Shoulder presses with these plates is also a worry-free routine now. Good quality plates with aluminum center holes. Highly recommend. Squatters Beware - Do NOT squat without Manta Ray! Talk about bumping into a seemingly simple item that has a day-and-night effect in your workout routine. 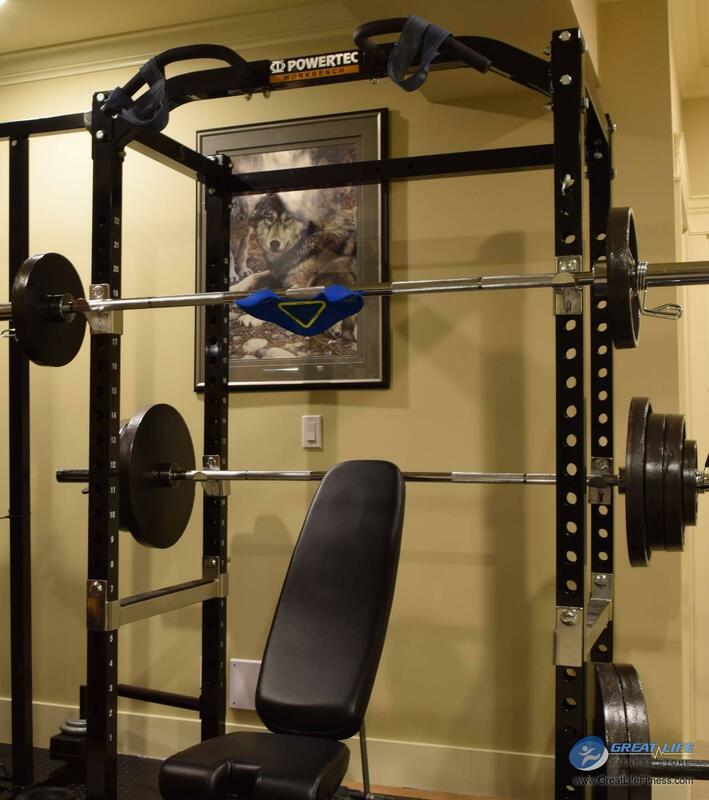 Recently I walked into Great Life Fitness store and saw a blue, manta ray looking thing attached to an Olympic bar that was sitting on a Powertec rack cage. At first I was dismissive as it looked fragile “plastic”, but after taking a close look, removed it from the bar and feeling it in my hands, I could tell that it was a solid piece of equipment. I asked the store employee if I could try it out and he happily accommodated me by adding 90lbs plates on the bar. The bar itself was 45lbs so the total weight of the load was 135lbs. 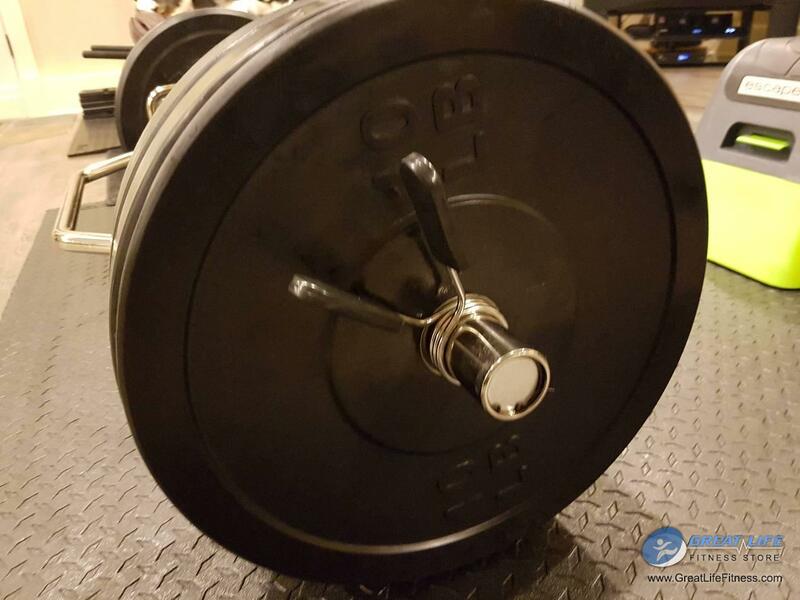 It is the same weight I used to do my squats with but I had stopped squatting quite some time ago due to a load being too strenuous on my neck and shoulders, not to mention various extra efforts I had to exert to keep the bar from rolling down my back or tip me forward. I even used to wrap the center of the bar with a rug piece and duct taped it to keep it in place, but it still was not providing enough padding I needed. As a result, the next thing I knew was that a squatting with heavy weight had been eliminated from my work out routine. However, with this attachment snapped to the middle of the bar, boy it was HUGE difference! I was able to do 12 squats on the spot and it was unbelievable as I had not done any squatting for a long time! I bought it right away and the squatting is back in my workout regimen since then. I wish I had discovered it sooner. 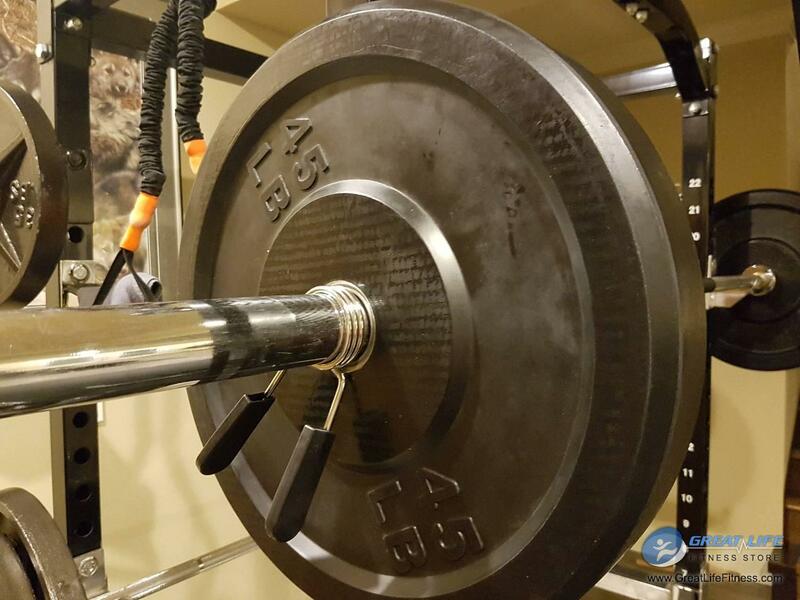 So, if you are considering to do a squatting, but the fear of various possible risks of handling the bar and the load is keeping you from doing it, the Manta Ray is a MUST item you should have. If any of your friends or family are fitness oriented, then it will be a great gift item too. I will HIGHLY recommend this to anyone who wants to enjoy the benefits of squatting, but is distanced away from doing so for one reason or another. Go and grab one and you will not be disappointed. I purchased one of these units recently, while trying to find a cheaper, more basic landmine to purchase. At first I thought it was overpriced. But after taking it home and using it, I am very pleased with the purchase. My money was well spent. 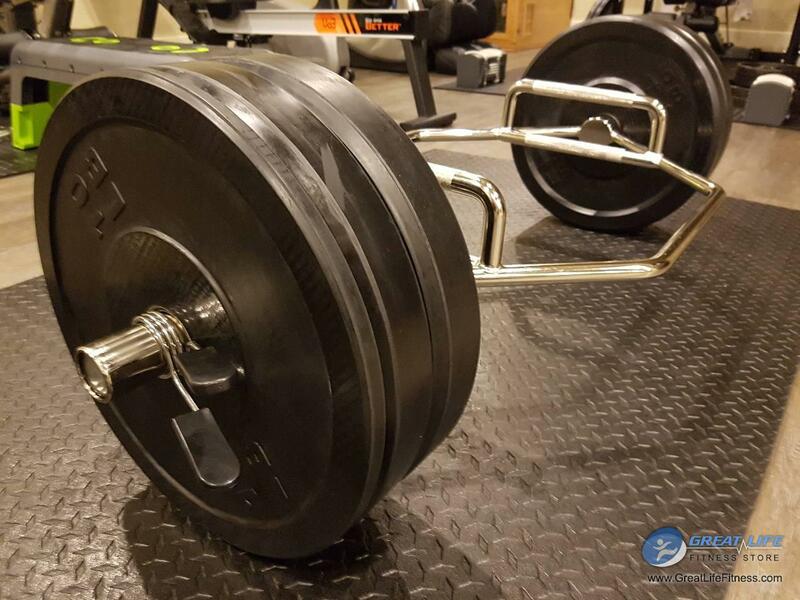 Having the option to use a standard barbell is a bonus. I heartily recommend this product. This machine seems fine to me. It wasn't outrageously expensive so I wasn't expecting a lot of bells and whistles. I do wish there was a way to set the resistance to be a little harder. I feel that my legs don't get as much of a workout as I would like. But overall I am pleased with it.